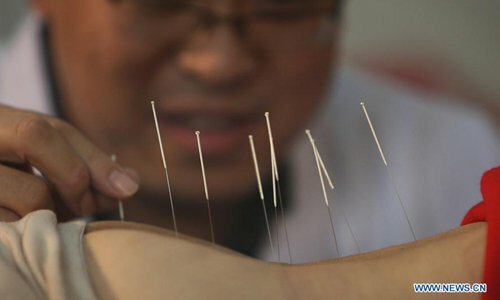 The World Health Organization (WHO) will endorse Traditional Chinese Medicine (TCM) next year, which practitioners of TCM see as a good chance to attract attention and resources to build a complete TCM system. British multidisciplinary scientific journal Nature reported that WHO will adopt the new version of its International Statistical Classification of Diseases and Related Health Problems (ICD), which will for the first time include details about traditional medicines. TCM classification will be found on Chapter 26, which will be implemented by WHO member states in 2022, Shanghai-based news website thepaper.cn reported on Monday. Zhou Yulan, a researcher at the Beijing Pharmaceutical Profession Association, said TCM and Western medicine complement each another. Recognizing TCM "will benefit humans especially with regard to the prevention of diseases and rehabilitation treatment," Zhou told the Global Times on Tuesday. TCM has been gaining recognition overseas during the past decades. Many foreign celebrities such as retired US Olympic swimming champion Michael Phelps and actress Jennifer Aniston were even photographed with signs of cupping therapy, one of TCM's acupuncture treatments. Beijing Tongrentang Group, one of China's most prestigious TCM pharmacies, had set up 115 retail stores in 25 countries and regions by 2016. While TCM is gaining in popularity, critics consider TCM practices unscientific and untested. "Some Western countries like Germany also have similar therapies, including herbal treatment, and they have standardized the dosage and treatment, which China should do more of," Zhou said. Being recognized by an international organization "is a great chance for TCM to obtain more attention and attract more resources and technology to make it a more complete and standardized system," Zhou noted.